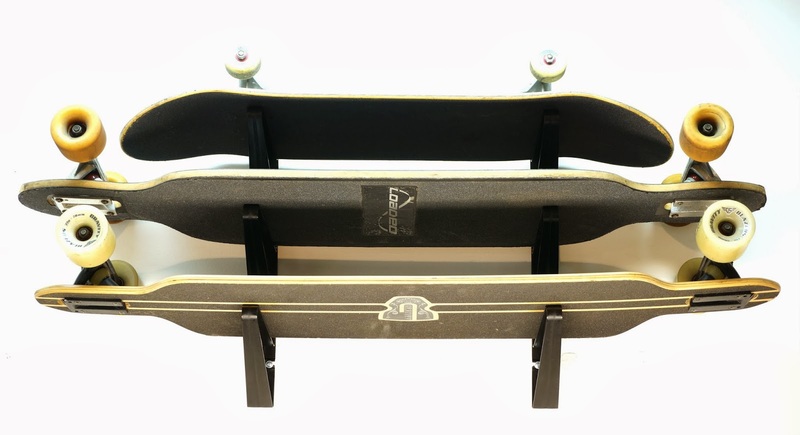 This super strong plastic skateboard storage racks is a really solid storage option. This rack gives you triple the skateboard storage at the same ($19.99) price as some other racks which means you can store all your boards no problem, all with the trucks still on so you're always locked and ready to ride. Not to mention that this rack is easy to install. Get one for your bedroom, living room, basement, garage, or wherever else you store and display your skateboards. This thing is freaking cool. It comes in two pieces and doesn’t require you to remove any parts of the board like some other hanging mounts. The bottom of the board is held in a sort of cradle, while the top part of the board leans against a magnet that’s screwed into the wall. Since it’s magnetic you can slap it up there on your down time, and pull it off the wall in a second when it’s time to skate. The beauty of this display solution is that it turns your board into an art piece. Right now this bad boy is only running you about $20 and you really can’t beat that. If you aren’t a fan of the hanging mount and want to display your board more traditionally (and horizontally), this might be just the thing for you. This mount doesn’t require you to remove any parts of the board so you can put it up and take it down at a moment's notice. The hooks can also be used to hang things like helmets and pads, or maybe a shoe or two. Also coming in at $20, it’s a great solution that won’t break your wallet. This one is a little different than the other 3. 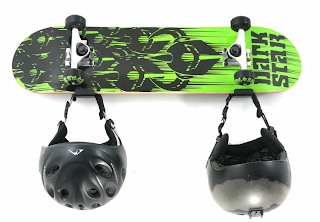 The skateboard hanger is just one piece that hooks under the trucks of your skateboard. You can hang this anywhere there’s a nail in the wall and move the whole setup whenever you feel like it. While not as elegant as other setups, this one has practicality on lock. This solution is perfect for the college student who doesn’t have much room in their dorm, and at only $10 it’s perfect for the college student’s wallet as well. So what do you think? What’s your favorite way to store your board?